The passage of time causes cells to age, decreasing the synthesis of many of those essential for maintaining youthful skin. As such, there is a reduction in the production of hyaluronic acid (HA), responsible for the level of tissue hydration, and Epidermal Growth Factor(EGF), essential for epidermal regeneration, giving rise to dreaded skin ageing. Over the years, synthesis of hyaluronic acid in the body reduces and degradation increases. The result is a loss of volume, a sagging facial contour and wrinkles, giving the face an old and tired appearance. The decrease in the amount of epidermal growth factor in the body results in reduced cellular activation and therefore a decrease in collagen and elastin production. Consequently there is a loss of elasticity and firmness, and wrinkles and weak skin appear. 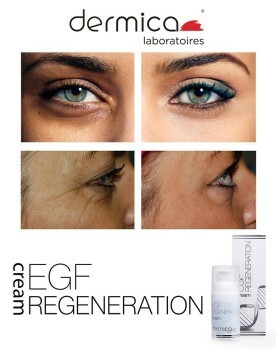 This is why Dermica Laboratoires, have developed EGF REGENERATION CREAM, a new biotech cosmetic product formulated using Hyaluronic Acid (HA)andEpidermal Growth Factor (EGF), which has proved highly effective in treating wrinkles and signs of ageing. Aqua, Cocos Nucifera Oil, Vitis Vinifera Seed Oil, PEG-6 Stearate, Dimethicone, Caprylic / Capric Triglyceride, Sodium Hyaluronate, Ceteth-20, PEG-18 Castor Oil Dioleate, PEG/PPG-4/12 Dimethicone, Carbomer, Steareth-20, Glyceryl Stearate, Potassium Sorbate, EDTA, BHT, Propylene Glycol, Triisopropanolamine, Pentaerythrityl Tetra-Di-T-Butyl Hydroxyhydrocinnamate, Tocopherol, Sh-Oligopeptide-1..